Acting as an art dealer doesn’t always mean you are going to be working exclusively with finished pieces, ready to hang at some collectors wall. Specially when you work with artist that do installation and street art, commission work is going to be an important part of your routine. Of course commission work has its own set of challenges. While selling art means you are dealing mostly on the collector side of you business, since all the negotiations and work with the artist have been made in advance. Working in a commission project means you have to deal with collector and artist at the same time and jump thru hoops to keep both happy. This week that’s exactly what I had to do. 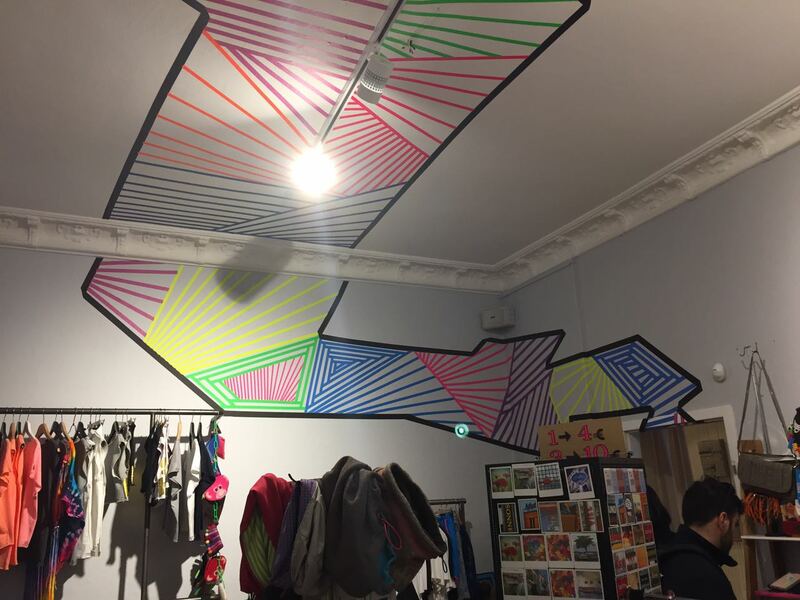 An long time client who has a series of design and fashion shops around Berlin has been preparing to open his newest shop and was searching for an tape artist to give some extra flair to his new shop. As I’ve been recently working a lot with Guillermo Quintana, and he is a greatly accomplished tape artist, I quickly realized he was the perfect match for this particular project. Another aspect that is exclusive to commission work, specially site-specific projects such as this one, is coordinating schedules and time frames, in the traditional art dealing, the artist works on his own timeframe and delivers a finished piece that you deliver to the collector and that’s it. Managing a double sided schedule can get very tricky very fast, so it’s something you have really pay attention to, or it could really get messy. After a rough start, the project seems to be going on a good path, the commissioner is incredibly happy with the partial results and Guillermo, as usual, is doing a great work. I believe that this could be a good example of how businesses and artists can collaborate together to mutual benefit. On one side there is a much nicer looking shop in Kreuzberg – Berlin. And on the other side an artist was able to create a large and important art piece that will have great visibility and might lead to further opportunities for him. Artists are usually cautious about working with brands and businesses, there is a fear that they might be considered as ‘selling out’. Sincerely, thats stupid. There has been a long story of artists that have collaborated with brands for the mutual benefit. One might even see the collaboration with such brands as a modern type of patronage, but instead of wealthy venetian families, artist team up with international brands.